High Compression,Firm Control. Shapes Your Waist. Give you a hourglass shape. Makes you sweat a lot which is great for detoxifying! It's need to be snug so you sweat better. Lose water weight faster, and cleanse your pores. 1.5mm single-layer neoprene fabric compression garment. Light weight & High quality of neoprene rubber. Interior pocket make you more convenient put any small things.Such as: earphone, mp3,key,rope an so on. 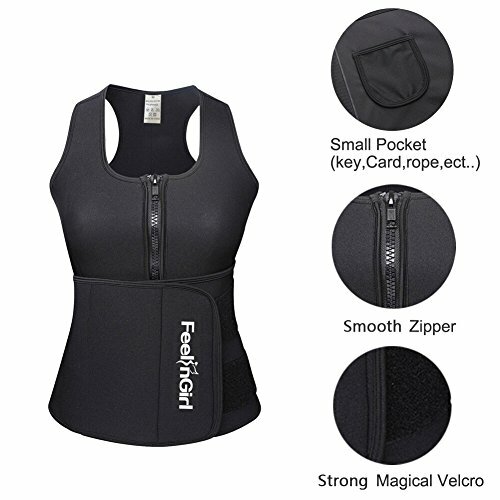 Racerback sports bra allows Free movemen, Full coverage even your lower belly! Wear it for workouts or daily activities.Keep you warm when you sweat outdoors in a very cold weather. Zipper front closure by bust area. Adjustable waistband with velcro closure.Perfect for Most Sizes.Keeps you as tight as you want. Makes you easy put on and take off. **Note** Don't use Amazon size chart. Please Check our own SIZE CHART provided in the photo on the left or check the Product Description.